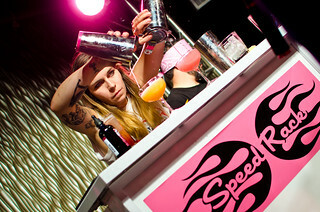 Speed Rack is a competition created by and for female bartenders. And, while we're at it, we're going to raise some money to fight breast cancer. 100% proceeds from the events we produce in each of our cities will go to breast cancer education, prevention and research. Speed Rack is a national cocktail competition featuring top female bartenders in key cocktail markets, putting them head to head in round robin style timed and judged challenges. It is the first competition to highlight the up and coming generation of strong women in the spirits industry.